You are more worried about your own career than about Israel. Olmert go home! A friend of mine was to be making a bris today. 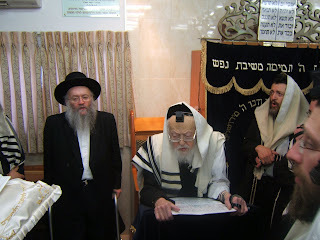 They wanted Rav Elyashiv to be the sandek, so they had to make the bris by Rav Elyashiv's shul. 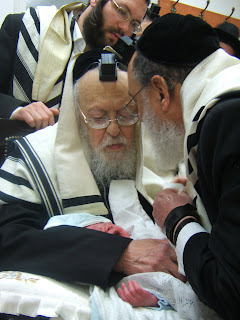 Rav Elyashiv is upwards of 96 years old (or so) and does not go very many places, and never leaves Yerushalayim. I was unsure of whether I would be able to go or not, but in the end, late last night, decided I would go and take a couple of my boys with me. It is not an everyday event and the chance to see a gadol is one you do not just ignore. So we got up at 5:15 to shower and go so we could be there for davening in Rav Elyashiv's shul at 6:20 am. I must say, the minyan I normally daven in also starts around the same time (6:25 am actually), but this minyan took much longer. It finished, with selichos for b'ha"b, at about 7:35 or so. They were very efficient and Rav Elyashiv wastes no time. The moment davening ended they were already calling "Kvater!" for the bris to start. being whisked away in the "gadolmobile"
I would like to add, and close with, an observation. 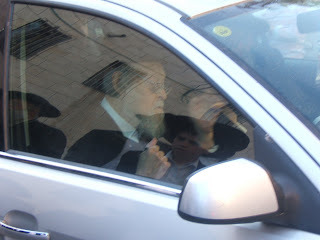 From what I could tell, Rav Elyashiv is oblivious to everything that goes on around him. Every spare moment he had he had his nose buried in a sefer learning. His "people" were running the show and telling him where to go. I suspect he did not even know there was a bris going on. They called him to be sandek - he looked up from his sefer and sort of grunted and they directed him to the chair. He is totally dedicated to learning Torah and nothing else. That reinforces in my mind the thought that if you ever hear something in Rav Elyashiv's name, you can be sure someone else told him to sign the paper or go somewhere. He was completely oblivious to and uninterested in whatever was going on outside of his sefer. Just my opinion. So, I am driving home tonight from my softball game on the main highway #1 when about 100 feet in front of me this car goes up in flames on the side of the road. Literally. The flames were like 10 feet high. Traffic is stopped. The firetrucks show up and begin dousing the flames. The black smoke is filling the highway. Everyone is getting out of their cars to go get a closer look. I was in the car tonight driving to my softball game and they were talking to this guy on the radio. I did not catch his name because I turned it on in the middle of the discussion, but he had been a defense adviser to 4 previous Prime Ministers of Israel; Begin, Shamir, Peres and Rabin. The discussion was about the latest smoking gun - the Winograd Interim Report being released tomorrow evening (actually tonight, as I am writing this after midnight) and whether the criticism is justified or not. Despite the fact that the report is being released tomorrow, everybody already knows most of what is contained in the report, as it was partially leaked today. It is practically the only thing being discussed on the radio and in the media right now, rightfully so. Anyways, this defense guy did not want to criticize the government for the decision making processes used during the war. As he said, he was not there and he only knows what he has heard, but was not part of it. So he was talking theoretically about the general situation. He raised a very interesting point. He said that the issue is not that Olmert decided to go to war or how he came to the decision or that he was supported in the Cabinet in that decision. His issue is after that decision. Olmert has been very big, in his attempts to spread the blame and try to tack some blame onto Tzippi Livni and at least make her share some of the fallout, on saying how all the decisions they made in the war were completely supported by the whole Cabinet. This defense guy said that alone shows there was something wrong with the process. He says it means that probably nobody asked too many questions. maybe somebody pressured them all to just follow the lead. He brought examples from many of Israel's wars and conflicts from the past 30 years, including Lebanon I, the Gulf Wars, the Intifadas, the attack on Osirak, etc. he showed that the decision making process was never unanimous, and often hanged on one vote in the Cabinet. It was always a battle to get approval for battles and procedures in war. Ministers wanted to know details, they asked questions they showed their disapproval when they felt something could be done better. Decisions were made, but they were always fights. he said, if decisions in this war passed so easily and were unanimously supported, that indicates something was wrong with the processes used. This thought of his reminded me of a concept in the Jewish court system. The Talmud tells us that when a beis din would be judging a case of a capital offense, with the death penalty on the line, there was an interesting condition. If the beis din unanimously voted that someone deserved the death penalty for his crime, the person would be let go unpunished. The reason for this, the gemara says, is that there is no way that not a single person on the beis din could not have found some merit by which the defendant deserved to be let off. If it is a unanimous decision to kill him, it means the procedure and discussion were faulty, and then no death penalty can be meted out. It is important to have open discussions on weighty matters where all viewpoints are presented and considered. When that does not happen, something is being muted. On another topic, I just want to mention that Tzippi Livni does not deserve to replace Olmert. If they give her the job (not that I think Olmert is going to give it up so quickly, but eventually it will come to it), she will only help destroy Kadima (a good thing in my opinion). Livni has shown no leadership skills. As Foreign Minister we hardly hear from her. Regarding all the Olmert scandals, her method has been to sit quietly on the side and let Olmert stew. She has not given him her support, as other Kadima members have done, but neither has she criticized him. She is sitting quietly and letting others do the dirty work. While that is a shrewd method of slipping into the job, she has shown absolutely no leadership. If she would take the high ground and talk against corruption and even against Olmert, she would deserve the job of replacing Olmert. But she is afraid to upset Olmert. I do not know why. Olmert's days as PM are numbered, no matter how you look at it, so I am not sure what she is afraid of. If she would show leadership, she would be given the position of head of Kadima much sooner. She would help effect Olmert's downfall and she would be in the position to take over. Livni is not a leader. That being said, depending on how harsh the actual wording of the report is, which we will only find out Monday evening after 5 pm, I think it is important that any of the other political parties in the Olmert government should resign from the government on the guise of not being able to support such a government of failure (supposedly the Report calls it that). If Lieberman (Yisrael Beiteinu), Labor, or Shas do not make any moves and only show support for Olmert, I think the backlash will be huge later. Olmert, and right now Kadima by association, is very unpopular. If the government falls in a few months instead of now, the people will be upset at the other parties that let Olmert and his government of failure stay in power for no reason for so long. If the wording is as harsh as it is rumored to be, I hope the other parties will be smart enough to bring Olmert down.If they don't, it will hurt them later. Of course, if the rumors are inaccurate and the report is not so harsh, then none of this applies. SoccerDad has posted Haveil Havalim #114. Check it out. According to Haaretz, Sandy Koufax has been drafted to play for the Modiin Miracle in the new Israel professional Baseball League. He is 71 years old and was the final player drafted. Can you imagine sitting next to Sandy Koufax on the bench in a baseball game in Israel? Or even better - imagine homering off Sandy, or even hitting a double off of the great Sandy Koufax! At least he will not have to worry about the dilemma of playing ball on Yom Kippur with his new team! Ynet had an article about Hava Mond. Hava Mond is a fashion model originally from Tzfat (Safed) who is religious and has remained religious despite the profession she has chosen as one of Israel's top models. The discussion around the internet and various forums, Areivim included, has centered on the question of whether such a woman can really be classified as religious or not. She chooses a profession in which it is nearly impossible to not do aveiros. While true she might be performing admirably in many issues, as she says she only eats kosher which sometimes means she does not eat all day as the only food available is often not kosher (she shoots a lot in the international scene), she davens twice a day, she keeps shabbos, etc.. other problems arise. The greatest issue is modesty. While she has her limits, she does model in non-tznius attire. So, is such a woman religious/frum is the question people are debating. I do not understand the discussion. Are we all perfect? Do none of us commit any aveiros, often willingly? Are the aveiros these people are committing any "worse" than the aveiros we might be committing in the privacy of our own homes without the newspapers letting everyone know?Would any of us consider ourselves not frum because of the aveiros we do? We each have our pekalach and we each have the mitzvos we enjoy doing and do better than other people and we each have the aveiros that we are more prone to doing than other people. This is the aveira that this woman does. Does that make her less frum than me or you? It is not for me to decide. My relationship with Hashem is between me and Hashem, yours is between you and Hashem and hers is between her and Hashem. Just like I do not know the details of your life, your mitzvos and your aveiros and it would be wrong and even impudent of me to assume I know how Hashem cherishes or not your relationship with Him, it is wrong of us to judge her and assume we know the details of her life and relationship with Hashem from one sketchy article and it is impudent to allow ourselves the liberty of judging the relationship she has with Hashem. I am being lazy and not really writing a real post. I have a couple in the drafts section waiting to be completed and posted, and I have a couple in my head (especially considering the latest political events of this week in Israel), but I am just not in the mood right now. So instead, I will share with you a few links for now. head on over to the JIBs and vote for your favorite blogs (don't forget me in Best Small blog group D and Slice of Life in Israel group A) and find some new and interesting blogs you might never have heard of before. Baleboostah put up the 6th edition of JPix carnival. MizEllie has some news she shares. Go give her some words of encouragement. Esser Agaroth wonders about some Yom Ha'Atzmaut happenings. A Mother in Israel discusses women's equality. Neil at Modern Uberdox found something he doesn't like doing. He had to do it anyway. Ari discusses the tutition crisis . I think he can solve it by moving to Israel. Tuition is bupkes here. Vote for Me!!! NO! Vote for Me!!! I was not going to do this, but I now figure "why not?". It is not that big a deal. The JIB awards are in full gear (practically). The site has even been hacked a couple of times. No website can claim any value or importance until it has been hacked, and now the JIBs have been hacked at least twice. So the JIBs are now important. I am competing in a few categories, but my Torah blogs are competing against a couple of big boys and have absolutely no chance (though I would have liked for Torah Thoughts to have a strong showing), so I will not even mention those. Life in Israel (this blog) is competing in Best Small Blog Group D and is still holding the Round 1 lead. The voting there is getting very close and my lead has been whittled down to just a couple of votes, so if you don't mind taking the time, head on over to the voting and vote for me. I am also competing in Best Slice of Life in Israel Group A but don't really have much of a chance. This is the category I would have preferred to be recognized in and maybe, with your help, we can have a putsch and make a run for second place (or, who knows, maybe even first). So head on over to the voting and vote for me. One thing I noticed differently about this years Yom Ha'Atzmaut from other years was the lack of Palestinian flags and black flags (mourning) flying in RBS B. Normally there are about a dozen or so PA flags and another dozen or so black flags flying in RBS B to protest Yom Ha'Atzmaut. This year, as far as I know, there were none. Granted, they held their annual protest rally in sackcloth, but this year there were no flags flying from the windows in the neighborhood. The debate rages every year. Both on a national level and on a personal level. Do you say Hallel or do you not say Hallel? If you do say Hallel, do you do say full Hallel or half Hallel? Do you say Hallel with a bracha or without a bracha? It has become an emotional issue rather than a halchic issue. I can easily say that in past years I have done pretty much every option ranging from no Hallel to full Hallel with a bracha. I seem to rethink the issue every year, though the past couple of years I have not said Hallel. This year we find ourselves in a situation of declining patriotism. It was recently reported that flag sales are down about 50%. Maybe everyone still has their flags from previous years so there was no need to buy new flags this year, or maybe less people are hanging them. People are upset at all the corruption being revealed in the government. People are upset at the way the government treats its citizens, from issues such as the disengagement to issues like the Second Lebanon War and many others. People feel they are treated as pawns while the leaders seem to be more concerned with their own political careers over the good of its citizens and the State. People have made that into THE issue of the day. If you don't say it they claim that you do not appreciate the State. 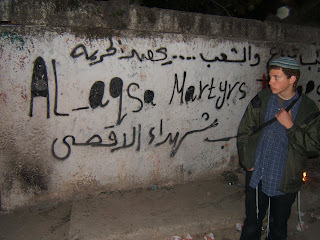 They say you are an anti-Zionist. They say you are not thankful. If you do say it, people say you are an ultra-Zionist. You are crazy after what the government has done. The State is led by evil, non-religious people. The State of Israel is the only place where Jewish blood flows freely. And more. But the truth is that Hallel is not really that important of an issue. Say it or don't say it. There are halachic factors that can be used to come to either conclusion and you should study the issues and weigh the factors and come to your conclusions, and consult with your Rav as well. There is plenty to be thankful for that, regardless of whether you say Hallel or not, you should consider and be grateful that we have returned and are in the process of returning to the Land of Israel. In my opinion, the evil and corruption perpetrated by current and recent governments should not be a factor in whether or not you say Hallel, now in whether or not you rejoice at some level. The evil perpetrated by current governments does not detract from the greatness of the miracles that took place in the formation of the State and the formation of a homeland for all Jews. About 100 years ago there were 50,000 Jews living in Israel/Palestine. In 1948 at the foundation of the State of Israel there were 806,000 Jews living here. Today there are 5,725,000 Jewish residents of Israel (of a total population of 7,150,000). All these Jews have a place to call their own. Sure, plenty of Israelis make "yerida" and leave Israel for greener pastures. However, most of those all have a desire to come back. They are away usually because of the finances involved, not because they do not see Israel as being vital to our existence. On the radio you can now hear interviews with all sorts of people - about relatives who died in battle, with people who founded the State or fought for it or came to it, etc. Everybody, the most non-religious included, says this is our land and we have no other to replace it. This is the land Hashem gave us and this is where we are meant to live. Despite the government being not-religious, the state is the greatest supporter of Torah learning in history. The State subsidizes almost all the Yeshivas and day schools in Israel. Even if it is a battle all the time to get improved religious services and more religious sensitivities from municipalities and State facilities, it is easy to live as a religious Jew, and it is supported by the State almost all the time. Despite the government being not-religious, Israel pushed off its Independence Day and Memorial Day to avoid any Shabbos desecration. Can you imagine another country pushing off its Independence Day, for any reason let alone to avoid desecration of something it does not even believe in? Sure its not perfect, it is far from perfect. But we still have a lot to celebrate and be thankful for. Yom Ha'Zikaron has begun. The siren blared tonight at 8pm and will sound again tomorrow morning at 11am. We will have our ceremony at work after the siren. Yom Ha'Zikaron, Memorial Day for the Fallen Soldiers, is a day of mixed emotions for me. On the one hand I have not lost any family or friends in battle. t makes it difficult to relate, to a certain extent. Think of it like this - how many of us think of Memorial Day in the United States as a day of anything more than a great day for picnics and baseball? Not too many, unless you have a relative who served in the US Army or some other connection, which in the Jewish religious community today is not too common. So the Yom Ha'Zikaron day is missing the "oomph" for me. On the other hand, we are all brothers, and it is not like the United States here. If you turn on the radio you will here somber music, as it is a day of national mourning and remembrance. You will here a list of names being read of over 22,000 fallen soldiers. You will hear stories of many of the soldiers who fell. So despite not being personally connected to the day, I still feel a national connection to the day. And even though I do not listen much to the radio (we do not get good reception at home, so basically I only listen when in the car and a bit at work), one cannot avoid but feeling the pain and grief of the families who have lost their sons and daughters, brothers and sisters. I was in the car this evening as Memorial Day began and they were telling over stories of some soldiers who had died. Every single soldier has a story. Each one had his aspirations and dreams. One had just been accepted into Officers School and was overjoyed at his prospects for leadership in the army when he fell in battle. Another died while saving other soldiers in his unit. Another died trying to liberate Jerusalem. And on. And on. Everybody has a story. Each soldier was a person. Yom Ha'Zikaron comes the day before Yom Ha'Atzmaut. We first mourn our fallen brethren and then rejoice in the gift they fell fighting for, either liberating or defending. It is a confusing juxtaposition of days. We go from a day of mourning to a day of joy. I remember when I was younger, in Yeshivah, and in my curiosity I would go to downtown Jerusalem to see the revelers celebrating on the night of Yom Ha'Atzmaut. It was exciting as everybody was in the street having a great time. But it was strange, as they had just finished mourning a couple of hours prior. It was like people are expected to "throw the switch" and go from mourning mode to celebrating mode. I think that placing these days so close to one another is similar to what we do in Judaism. When we have celebratory events, we are meant to temper them. We tone down our simchas by remembering the churban - the destruction of our temple. We often do not know what that means and just go through the motions. I remember at my wedding when the Rosh Yeshiva put the ash on my head. Everybody is concerned about where to get the ash and who smokes and what to burn and where on the head to put it. Nobody told me what it was supposed to mean. Sure I knew it was to remember the churban, but that meant nothing to me. It was just a curious custom. We break a glass under the chuppa. As soon as the glass is broken everybody screams out mazel tov and the band starts playing its music. Do we remember that breaking the glass is another custom meant to evoke thoughts of the churban? When one builds or paints a house he is meant to leave a square unpainted in a place visible when he walks into the house. His joy is supposed to be tempered by remembering the destruction of the temple. But what do we do? Some of us decorate that square so it looks beautiful. Some of us just don't bother with the square at all (though it is more common in Israel). These memories and thoughts are difficult to effect, as we get further and further from the destruction. Yet we are still supposed to recognize it as an embedded trauma in our nation. There are many other similar customs in Judaism. They are meant to evoke these thoughts. At the time of our joy, we are meant to remember our sadness. No joy can be complete as long as the national trauma is still festering. Our Yom Ha'atzmaut is joyous as we celebrate the gift of the Land of Israel. But we have to temper that joy by first remembering those who fell fighting for us. They fought so that we could live here safely. Today we will hear some of the names and some of the stories, and tomorrow we will celebrate. yom hashoah was a very moving day. one of the things i never had was a proper Zionist education and i feel bad that there are religious jews that oppose these days so strongly. first, our commander sat down with us and we spoke about the day and what it means to each and every one of us. some guys said they didnt really relate to the day at all other than it has to be remembered. also, these kids are 18 years old and not really comfortable with saying how they really feel about things so i got up and spoke about what the day means to me. i remember my bubby kupfer when she came home from the hospital after her alzheimers had gotten really bad. i remember her looking at my tzitzit, grabbing them and crying. she asked me if i was a jew and if there was kosher food. she asked me if there were other jews alive. she told me to take them off before someone catches me. she asked if i was allowed to go out in the streets with tzitzit on. i thought she would keel over and die when i showed her my tefillin. she asked if we were safe. if we were allowed to be jews. i remember going to shul on that july 4th weekend in '99 the morning after the white-supremacist, Benjamin Smith, opened fire on members of my synogague as they were on their way home to their families and their friday night meals. in high-school, shortly after 9/11 when in the middle of the night someone threw Molotov cocktails at our dormitories. i remember in college when a fellow student came up to me and said - "are you jewish? ive never met a jew before. they tell me you killed christ." there are people that hate us for being jewish. just for being born a Jew. for having a heritage and history that is a foundation of modern western society. for writing a book that changed the world. and i know that if not for medinat yisroel and tsaha''l, there isnt a single jew in the world who would have the balls today to walk in the streets with his tzitzit out. or to wear a black hat in public let alone to go visit our psychopath cousin Ahmajenidad. there isnt a single jew out there who doesnt feel the chills of pride when he hears the story of how the tsankhanim recaptured the kotel and Motti Gur shouting into the radio "har habayit biyadenu, ani chozer, har habayit biyadenu." tsaha'l and Medinat Yisroel give us in chutz la'aretz the strength, the pride, and the courage to stand tall. to be jews. secular or religious, it gives us the strength to be proud of who we are. it keeps us safe by providing a home that any jew at any time can go back to. afterwards, there was a ceremony for the entire base. poems were read, songs were sung, yizkor was recited and a torch was lit. the M.C. had this clipboard painted black with a yellow magen david in the center. we had a moment of silence, saluted, and sang hatikvah. The voting round for the JIB awards has officially opened. There are a lot of great blogs competing and you should be encouraged to check them all out and vote for your favorites. If that might be me, I am competing in a few categories. Life in Israel can be found in Best All Around subcategory Best Small Blog Group D.
In Best of Class in subcategory Best Torah Blog Group B I am actually competing against myself (and other blogs). You can find Yontiff Thoughts and Torah Thoughts there. In Best of Class subcategory Best Slice of Life in Israel Group A I am competing with the Life in Israel blog. Feel free to vote for me, or feel free to vote for any of the other great blogs. I am not much of a campaigner. The important thing is to go vote. Soccer Dad is kicking around Haveil Havalim #113. Go check it out. The Chabad website Shturem.net posted about the Israeli funeral of the hero of the Virginia Tech shooting, Liviu Librescu, on April 16, 2007. As we all know, Librescu heroically gave up his life while saving his students from the shooter by physically blocking the shooter from entering his classroom. They included some video footage of the funeral. I uploaded the video to Google Video so I could share it with you. It is mostly in Hebrew, so I apologize if you do not understand it, but there is some English near the end. A very moving part of the video is when the Chabad Rabbi,Rabbi Cohen, says, "Until now you were a very small family. Now your family has expanded and includes the millions of people and hundreds of thousands of Jews that feel connected to you and feel connected to the Jewish Nation, due to the merit of your father." At that point, his widow, Ms. Librescu, breaks down emotionally in tears. By now pretty much everybody has seen the stunning photograph snapped by Israeli photographer Oded Balilty during the destruction of Amona last year. This photograph won Balilty a Pulitzer Prize. 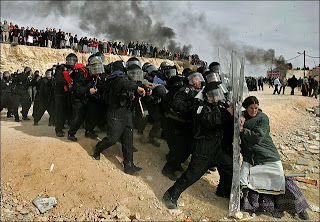 The photo is shocking in its contrast and shows the courage of a young woman standing strong (or at least trying to) against dozens of policemen. Ynet has interviewed this young woman, Nili, and asked her what she thought of the award winning photograph. It is well worth your time to read it. She expresses her self very articulately and puts the whole thing into perspective.. This is the latest story making waves.. Seven pupils at a Beit Ya'akov school in Netanya were punished after they stood up for the siren that sounded Monday in honor of Holocaust Memorial Day (Monday), Yediot Aharonot reported. According to the report, the school principal removed the girls from their classroom and forced them to stand up for the rest of the day and read psalms. In haredi circles, using sirens and "moments of silence" to mark memorial holidays is considered a gentile custom and is discouraged. Haredi rabbis often encourage their followers to recite psalms or other prayers silently during the siren. I saw the original article in the Yediot, and then Jameel sent it to me.. I agree with Jameel's position that the method of punishment was wrong, though that is not what I want to write about. We were talking here about Yom Ha'Shoah on Yom Ha'Shoah eve over dinner with the kids. We were talking about different aspects of it, including the siren and what to do when the siren blares, and what their schools would be doing and what we remembered they had done in previous years. The kids asked me what I do and what I think should be done when the siren goes off. I told them that if they are in school, and I would assume (never safe to do so, but I am anyway) that the school would make sure the kids were in class at the time rather than at recess, they should do whatever the school does and whatever the teacher tells them. If, on the other hand, they should find themselves outside in public, or anywhere else around other people, during the siren, then they should stand still during the siren. I told them that the way we commemorate the Holocaust and Memorial Day in Israel is by standing still and contemplating the events behind the day, so to not do so in view of other people is grossly disrespectful and inappropriate, and furthermore because we are religious it would clearly constitute a chillul Hashem and cause anger and even hatred of the religious. Some of the common arguments against standing still are; it is not a Jewish way of remembering the dead, it is a waste of time and better to learn or say tehillim or something like that, etc. I, personally, do not find standing still for a minute to be such a bad thing. I waste plenty of time doing other things (blogging could clearly be in the list) that standing still for two minutes during the wail of the siren is completely insignificant as far as the amount of time wasted. The only people who can be concerned about the wasted time are people who are careful to utilize every minute of the day properly, and there are not too many of those people. That time can be used to think about the events of the day, which is not such a bad thing. How often do we take the time to stop and think about them? This gives us that opportunity. If one is truly worried about the time wasted, he could say tehillim while standing still, or find ways to not waste those two minutes while standing there. I believe these excuses are exactly that - excuses. not reasons. They are excuses that have been found to rationalize not participating in an event that Israeli society holds. So, my daughter (11 years old) smirked and told me that I sound like a chiloni (a secular Jew) saying they should stand when they are outside. I told her that standing is not important on its own. If someone is learning Torah when the siren goes off, they should not stop learning and stand. That would be a waste of time and learning Torah is much more important that standing still. However, if one is not learning and is found among other people then they must stand still and behave as part of society. We live in Israel - a country with rules and all sorts of people, and we have to behave accordingly, even if sometimes we do not agree. She seemed to accept that. That being said, back to the story reported of the girls who stood up during class and got punished. I feel the punishment was probably ill chosen and Jameel said it better than I can, so I will leave that issue. I do feel the girls were wrong. They disrupted a class that was studying and they should not have done so. If they felt so strongly about it, they could have asked to be let out, or they could have come late that day to school or stayed home or whatever. They were not standing up because they believe in it (or at least I doubt it), rather I think they were pulling a prank and looking for a way to make a disruption in class, and they succeeded. They are studying in a school that does not commemorate the day in that fashion, they live in a community that does not do so, and they come from families that do not do so. The impetus that pushed them to stand in class was not belief in the idea, but to make trouble. They deserved to be punished (and as to what the appropriate punishment should be, I have no idea) because they were wrong for disrupting their Torah studies and the classroom. MK Aryeh Eldad has submitted a proposal for a new law that would say that any government that has above 10% of its ministers under investigation, that government will be declared a "Government of Disgrace" and will be dissolved, as if the PM had resigned, and all the laws relating to effecting new elections in such a situation would apply. The current government has 26 ministers. 3 of them (Olmert, Hirschson and Edri) are currently under investigation, not including Haim Ramon who has already been convicted. If the law passes, that would put this government in a very precarious position. The only problem I see with this law (aside from possibly grandfathering the current government) is that the Prime Minister could simply appoint some new ministers (thereby lowering the percentages) or fire the ones under investigation and thereby avoid the repercussions. I wonder if the proposed law will deal with such manipulation. PM Ehud Olmert said, "I am indestructible. I have been here for 35 years and I have survived everything." Let me just say - nobdy is indestructible, especially not politicians, let alone politicians with approval ratings in the single digits. Sure, he might pull out of it and do something so popular that he survives and stays PM. There is the chance. However to declare at this time that he is indestructable, is the height of haughtiness. The case was brought to the Supreme Court who ruled that such a separation of sexes and not allowing women to eulogize is religious coercion and discrimination and therefore illegal. If a woman wishes to eulogize, the burial society must allow her to do so. I am not going to discuss the actual ruling of allowing women to eulogize. I, personally, see nothing wrong with it. The gemara discusses the situation of the times then that women were professional wailers and lamenters at funerals (they would get paid to do so when necessary), so the issues of tznius do not bother me in this situation. There are other gemaras that say that a woman in her time of sorrow or distress is not enticing, specifically I remember the gemara regarding sotah that the woman would have her hair uncovered and her shirt torn in the middle of the Beis HaMikdash. the gemara discusses how that could be as it is immodest, and the gemara says that a woman in such a situation would not cause improper thoughts among the people, as she is in distress and sorrow. It also does not bother me to not allow women to eulogize. That is the custom and has been so for hundreds of years, and in Petach Tikva it has been so since its inception in 1878. Whichever way they go with this will be fine with me. I do want to mention that a number of blogs, including FailedMessiah, have taken this as another opportunity to bash the Haredim as trying to change the system and ban women from eulogizing. They, supposedly, have found this as another method of controlling society to act according to their own whims. I protest such blatant anti-religious/anti-Haredi claims. His criticism is based on false assumptions, and I so commented on Fialed Messiah's post . There are many unusual customs associated with "Minhagei Yerushalayim" - the customs of Jerusalem. They include nto allowing children of the deceased to the cemetary at a funeral, light shabbos candles 40 minutes prior to sunset on Friday, not saying v'shamru in the Friday night prayers, saying Sim Shalom in the Saturday afternoon prayers instead of Shalom Rav, along with many other customs. Another such custom was to not allow women to eulogize. I do not know how these customs came about. They are generally, though not always, associated with the Vilna Gaon customs, as his students came to the Holy Land in the mid-1800's and established their customs as primary customs for the land, well before the establishment of the State. Why these customs took root, I do not know. Specifically regarding the custom of women not eulogizing, I have no idea how it began. Maybe 200 years ago it was a form of suppresion, as women were generally suppresed back then. I do not know. Maybe it has halachic sources aside from social ones. I do not know. I do want to say though that Petah Tikva was founded in 1878 by expatriates of Jerusalem. When they founded Petah Tikva, they established the town with the customs of Jerusalem, including all the minhagei Yerushalayim. They light candles 40 minutes before sunset on friday, they skip "v'shamru" and all the rest of the minhagim. Petah Tikva is the city with the closest association to Yerushalayim of any other in the sense of its minhagim. The Rabbonim leading the burial society who stopped Ms. Luvitch from eulogizing her father were not attempting to wrest control of society into Haredi hands. They were adhering to customs that have been in effect for 150 years or maybe even more. They were keeping the status quo and it was Ms. Luvitch who was, probably without her knowledge, trying to change the system. Many of these customs are in the process of change, as modern society sees things differently than when the customs were established. I have been to many funerals where the children attended even at the cemetary, for example. The burial societies are more sensitive to the people's needs and do not always enforce the customs. This specific custom in question is clearly on the chopping block and will be naturally phased out, speeded up with the aid of the current Supreme Court decision. Again, the specific custom does not bother me. Either it will hold up or it will go the way of other customs that have fallen. I protest the grab of every opportunity to bash the Haredim, especially when it is baseless. My brother, a volunteer combat soldier in the Israeli army told me this story. He had a trainging session today with weapons. His instructor told the group that if the need should arise, they should kill first and ask later. He said, if you get captured you cannot rely on Olmert to get you back, so don't get captured. Isn't it great that our army trusts the Prime Minister and the other "decision makers"??? I just heard this story from someone who was involved and knows the story firsthand. This person is the CEO of a mental health facility. He told me: A certain Minister of Health (not the current one) came to tour this mental health facility. Somehow at some point he got stuck on his own in an enclosed, "padded" area. He called over the nurses to help him get out and he said "I am the Minister of Health and got lost, please help me out". Modern technology is great; We save bundles on the phone bill. Whether you use Google Talk, Skype, or one of many such services. Whether you use VOIP services for your regular phone. Communication has become fairly instant. Email. Messenger. Google Chat. Blogging. Downloading movies/music/software (legally of course). One million and one other ways as well. But there is a downside as well. My kids cannot tell time. They also cannot tie their own shoes. This is the result of digital watches and Velcro. I know plenty of yeshiva guys who can hardly read a page of gemara on their own. This is a result of ArtScroll. I know plenty of people who cannot spell (typos not included). This is a result of the proliferation of sms text messaging that has developed its own "language" of shortened words. This is also the result of spellcheckers and automatic spell correcting in word processors. While modern technology is great, it has its bad side effects. Sure, ArtScroll has done great work opening treasures of Torah and making them available to people who otherwise would never have been able to learn a page of gemara. But all the guys who should be able to learn on their own but have been relying on ArtScroll gemaras as the easy path are now unintended roadkill. 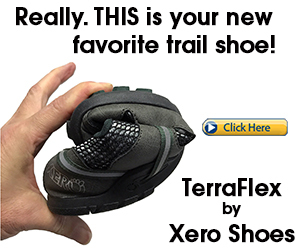 Sure Velcro saves people time and hassle on many things, but kids do not learn to tie their shoes. Does it matter? I do not know. What is the big deal if a kid needs to tell time by looking at his digital watch and does not ever learn to read an old fashioned timepiece? Who cares of he cannot tie his shoes? Is he missing any skills that will not allow him to survive in modern society? Maybe I am just too old fashioned that I think these skills are important. Maybe they really are not. I have been thinking about getting a GPS device. You know - those little machines that talk to you and tell you which way to drive so you don't get lost. It calculates the best route and helps you get to your destination in a timely fashion. I am kind of neurotic about directions. When I get into the car to drive to a new unfamiliar destinations, I will usually take out the map and check the route. I will also do this before I get in the car. Then while we are driving I will make my wife hold the road map and follow along the route with occasionally updating me with directions. Getting a GPS would save all that aggravation and my driving her crazy. But will it make me lose my sense of direction? Sure I occasionally get lost now, and with a GPS those days of driving around looking for a street not on the map (or with the map not available) will be long gone. But getting lost around Israel has also allowed me to see places I never otherwise would have seen. Are all these time saving devices worth it? Do we really save time? I have read articles and studies that indicate that with all the time saving devices we have and use, our lives should be less stressful and more enjoyable. Yet, the studies say, our lives are full of stress and we have less time available than ever before. So do I get the GPS and lose the skill of naturally getting from one place to another or do I keep on winging it every time I get behind the wheel? Robbie gives us a review of some of the broadcasted aspects of the evening ceremonies. The he discusses whether we are remembering in the right way. I wrote about a story I read, along with a review of the story behind the famous tune of ani maamin. Dzeni from New Zealand remembers the variety of people who perished, including family members. Irina discusses some of the psychology around the Yom Ha'Shoah remembrance. Jack reminds us that the past is important to remember so that we will realize we must save our future. Olah Chadasha brings us a video on holocaust denial that emphasises the importance of Never Again! BagelBlogger points us to a website with shocking photos from the Shoah. He also reviewed the history of the Pope and Vatican regarding the Holocaust. Ya'aqov at Esser Agaroth describes for us current holocausts in progress and points us in the direction of organizatons working on preventing them. While this is a bit unconventional, Elchonon posted in a "talkback" to a YNet article on Yom Ha'Shoah, instead of on his blog. In the talkback comment he talks about how Chareidim are really the answer to the holocaust and the true manifestation of Never Again. Go down to the bottom of the article and open talkback #3 to read Elchonon's piece and then in #6 he continues with a response. YidWithLid discusses abuse of the memory of the holocaust and then explains how we should be rededicating ourselves to ensuring nothing like this happens ever again anywhere or to anybody, instead of just remembering. OneJerusalem talks about the strength resulting from Yom Ha'Shoah. RHM has an important discussion the issue of the timing of Yom Ha'Shoah. This debate comes up every year. DovBear puts forth a strong argument in the debate of the appropriateness of the timing of Yom Ha'Shoah. Carl points us to the stories of the torch bearers from this years ceremonies. SmoothStone points us to the story of a collection of hidden family pictures. The SultanKnish talks about how remembering is just something we do..
Heichal HaNegina relates a story about the famous Rav David Werdyger. JoeSettler discusses how the kollel system is an appropriate response to the holocaust. LOR shows us an image of Godliness and evil. CosmicX tells us that nothing has changed. Dave Bender points us to some online exhibitions. Little Frumhouse on the Prairie points us to some as well. Kumah points us to a photo essay from the siren sounding. Ari explains Yom Ha'Shoah and offers some recommended reading. Here Ari remembers his grandmother's brother. Then he connects the Eurovision to Holocaust remembrance. BenChorin puts Yom Ha'Shoah into perspective. Jeffrey at MyObiterDichta talks about a relative who left a diary buried in a milk can in Warsaw..
SJ tells us why she does not read Holocaust books. WestBankMama sent in a post from last year about learning to shoot a gun. Jameel commemorated Yom Ha'Shoah in Hungary. If you are going to only read one Yom Ha'Shoah post, in my opinion this is the one it should be. Martha remembers from the US Holocaust Museum. Miriam is trying to remember her father in law appropriately. There is always the story of how Rose survived the Holocaust at Roses Story. Rick tells us a story of a survivor from a town called Bochelow. It's Almost Supernatural describes the ceremony he attended at West Park cemetary. I have become one of them!!! To put it mildly, I am generally not the one in the shul with the longest shmoneh esrei. I can daven pretty fast and on a day where I am fast forward setting, I can be one of the first to finish. On the other hand, I have been improving the level of my kavvana over the past few months, and while I still sometimes finish pretty fast, usually I am now somewhere in the middle. On a day that I can get some good concentration, I might even make it pretty far into the pack. When saying shmoneh esrei, I always found that upon completion the chazzan almost always has to waita good few minutes to get the ten people so he can start the repetition. He might get 7 or 8 guys finished and then the rest will often be saying their own prayers slowly and everyone has to wait for a couple more guys to finish. That always annoyed me. Not a lot. I guess it would depend on how slow they were davening. 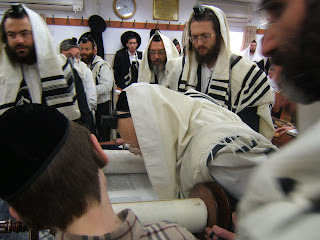 The kicker is that no matter how slow they were davening, as soon as the chazzan gets his final 10 guys ready and starts the repetition, most of the other slow daveners will finish their prayers within the next minute, almost as if they wanted to make sure everyone saw they were davening slowly. As soon as everyone notices, they can finish up. As a "fast davener" I always noticed that and it sort of amused me, and if I was in a rush it annoyed me. I would sometimes think "tircha d'tzibbura" -they are causing us all to be delayed and wait for them. they should speed up. Now that I am slowing down I find myself in a predicament. It has happened, more than once, specifically today at mincha, where we had a minyan m'tzumtzam, an exact minyan. By my davening a slow shmoneh esrei I am causing everyone else to wait for me. But if I speed up so people do not have to wait for me, I do not get to have the level of concentration I would have liked to have, and maybe I miss out on asking for certain requests and tefillos I would have liked to say. 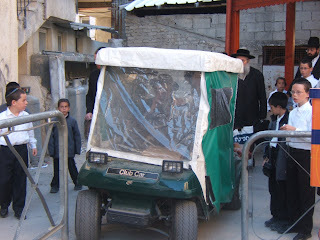 It happens to be that when I noticed that the chazzan had finished and was waiting for just a couple more people, including me, I sped up so the services would not be delayed because of me. I now understand them a little better, as I find myself in their situation. My question is am I supposed to speed up, as I have been doing when I find them waiting for me, or am I under no such obligation and I can daven for as long as I want/need? Yid With Lid stayed up late to work on HH #112 - you can't even tell it was 2 am, that's how good a job he did!! Last year I wrote about a Multi-Cultured Holocaust thought from a ceremony at work. The Holocaust was never really "my thing". I was not big on reading holocaust books or listening to holocaust stories. I always felt we dwell too much on the Holocaust. Sure, it was horrible and horrific and all that, but it never really appealed to me. We tend to abuse the memory of the Holocaust. We hear about people calling anybody they think is opposing them a "Nazi", from any member of the KKK or any stupid skinhead, to an Israeli policeman. We compare events and political issues to the holocaust and then we talk about how evil it is to make such comparisons. Guilt has always been a big part of being Jewish. The Holocaust is no different. It is as if we all feel guilty all the time, and we are supposed to. It is as if we have no right to exist aside from the fact that they tried to exterminate us. Whenever I heard "Holocaust" I would tune out. Sure, I've been to Yad Va'Shem a dozen times (though not recently). Sure I have read plenty of books over the years. Sure I had a grandmother who survived the Holocaust. She even wrote a book (unpublished) that I never read until recently. But as I get older I seem to be coming to terms with it. Sure, I still think we overdo it; We still abuse the memory of the Holocaust. But I am more open to reading about it nowadays. I "enjoy" stories of gvurah (strength and heroism) from the Holocaust, be it gvurah on a religious level or a physical level (like the Warsaw Ghetto uprising). Like the story I just read of the Satmar Rebbe. Someone in the town had taken a pair of shoes from stuff the Nazis had confiscated. The Nazis rounded up all the people from the town and asked who took them. When nobody came forward, the Nazi threatened to shoot everyone on the spot unless the person came forward immediately. The Satmar Rebbe, one of those among the group but not the one who had taken the shoes, stepped forward and said he had taken the shoes. He did so to protect the lives of all those people, while knowing he was giving up his own life in the process. The Nazi "stood down" and let them all go as he got distracted by another transport coming through just then. Yom Ha'Shoah is tomorrow. We will have our ceremony at work, as we do annually, in which we say two chapters of Tehiillim, a mishna and a kel moleh for those who perished and we will conclude by singing the famous song of ani maamin. What were you doing last night at 3am? I am not someone who does things spontaneously. I do not like surprises and like to stick to my general plans. Last night I did what is definitely one of the most spontaneous things I have done in a very long time. At about 2:30 AM I get an sms text message from my friend Elchonon. I do not know why I saw it, but the message said that he had to beat up 50 people to get on the bus. I asked back "the bus to where?" and he tells me he is at the grave of Yehoshua Bin Nun. I told him I had been there a few years ago and had he told me about the trip I wold have like to go with him. He told me there are buses all night and I can go to Geula in jerusalem and get on the last bus still. I got dressed and I was out of the house by 2:40 am and on my way to Jerusalem. I found the bus location and fought my way on to the last bus. I slept most of the way there and when I woke up we were already in the middle of the Arab village called Timnas Harsa, a.k.a. Timnas Heres as it is called in the navi Yehoshua described as the burial place of Yehoshua Bin Nun. This shabbos is the yahrtzeit of Yehoshua Bin Nun and every year the army opens up his grave site for access to Jews on his yahrtzeit. It is the one day a year Jews can go there to pray. 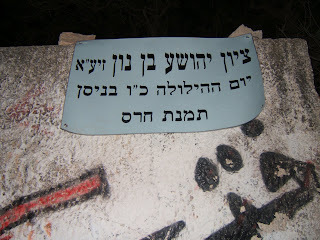 Along with Yehoshua Bin Nun, in the same village is also buried Calev Ben Yefune. 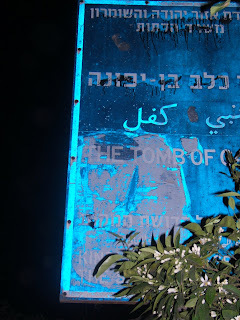 The grave with the blue marker is that of Calev, while the white-walled gravesite is that of Yehoshua. 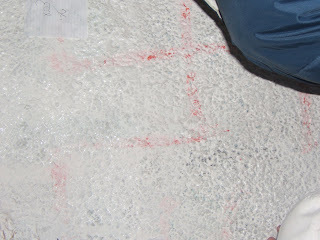 They are covered with graffitti as you can see from the following pictures. I got back at about 9 am, just a few minutes late for my weekly Friday morning chavrusa. Definitely a worthwhile trip, even though I lost a night of sleep. It was a special experience to be able to go to Yehoshua's gravesite. He was one of our early leaders. He brought our nation into Israel and administered the division of the land among the Tribes. Yehoshua was the student and assistant of Moshe Rabeinu. We study the book he wrote as the first book of the Neviim. This was an experience of connecting with our past. An experience that is rare, and the opportunity must be jumped at. 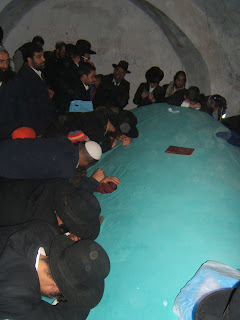 I just found out that this night at Kever Yehoshua seems to have been sponsored by the jblog society. Every shift that was at the kever last night had a jblogger, which is pretty amazing considering 90% of the attendees are Breslaver Chassidim. I just got off the phone with Jameel - he was there on the first shift from 12:00 am to 1:30 am. Elchonon was there from about 1:30 until about 3:30. I was there from about 4:15 until 6:45. Shimon Peres, "Israel has invested some 60 billion shekels in the territories [Judea, Samaria and Gaza]. Instead of this, we must invest in the sea, and stretch our western border in that direction by building artificial islands." He brings new meaning to the old desire of the Arabs surrounding us to "throw the Jews into the sea". I assume that just like in the '70's Peres was a supporter of the settlements and even established settlements over the Green Line as Minister of Defense and then later changed his position and supports dismantling the settlements and handing that land to the Arabs as a token of goodwill for the possibility of future peace, the same will hold true with this idea. He will build artificial islands and eventually advocate handing them over for potential peace. This really has nothing to do with Israel (o.k. it does because we use computers in Israel), but I feel like writing about it anyways. According to this, Microsoft has begun telling computer makers that they will be phasing out Windows XP by the end of the year. It seems that the new Windows Vista which was recently released into the marketplace has not been received warmly by the adoring public. Microsoft does not know what to do because they cannot move the boxes of Vista from their warehouses. So they are going to try forcing people to buy it. They will not be able to buy XP any longer, after the end of the year, and will have to go to Vista. I will add that we have one computer at work with Vista and it is horrible. The user hates it and I hate it. None of our internal applications work on it. The interactivity on it is horrible and annoying. I have yet to find anybody who is happy or even just satisfied using Windows Vista. If Linux has not yet been a big enough threat to Windows, they now have the opportunity to make a move. Consumers will not be happy about this latest development. In the end I would guess that Microsoft will be forced to capitulate and not cancel XP. why a BT would change? What would you do if you found out you were not Jewish? If you were suddenly told that you were adopted as a child, a non-Jewish child, and converted to Judaism, you are given a choice whether to accept that original conversion performed in your youth or to reject it and live on as a non-Jew. What would you do? It happened to someone my wife knew a long time ago and she (17 years old at the time) decided to reject the conversion and live as a non-Jew. I never really understood why people convert to Judaism. People can continue to live their lives as gentiles and still live meaningful lives. They can change their ways and habits if they are unhappy with the circumstances within which they find themselves. They can change all sorts of things, but to change and convert to Judaism is something I never really understood. Of course there are exceptions where someone is specifically drawn to Judaism and then it seems like an obvious change, but that is not usually the case, especially in today's world of assimilation and intermarriage. The Baleboostah wrote a nice write-up a while back about why she and her family are converting to Judaism and I wonder whether most converts have similar reasons. I do not know what I would do in that case. A non-Jew could be a wonderful person and righteous and merit a portion in The World to Come, all without converting to Judaism. And he would do that without all the restrictions Judaism would place on him as a convert, let alone the societal (not necessarily halachic) restrictions. The situation is different, I think, with Baalei T'shuva. Hirshel wrote about how he does not understand why people become frum and how many more are leaving the path than those joining (I am not familiar with the statistics so I do not know if that is accurate or not). Hirshel is getting a lot of flak because people misunderstood his point. People think he is saying that living a frum lifestyle is not worthwhile or valid. That is not what he meant and while I do not agree with his conclusions, I understand his point. I think I understand the Baal T'shuva better than I do the convert because the Baa' T'shuva is already Jewish. The Baal T'shuva sees religion as the correct path within Judaism and has decided that he wants to live according to the correct path. It will not be easy making the change, but he is willing to go through the hardships in order to be honest with himself and his beliefs. I would wish that our society would be more open and accepting of Baalei T'shuva than it currently is. There are countless stories of schools that refuse entry to children of Baalei T'shuva and the like. We seem to want people to become Baalei T'shuva but then don't want to associate with them once they do. The JIBs are now open! nominee for Humra of the Month award! don't listen to music during sefira?